This year we have purchased some new Rams. It has been a little hectic having more than one or two Rams on the farm. Right now we have five, more than we have ever had at one time. A ram purchase is an important one. He makes up half of your flock. I have 12 Border Leicester Ewes with one Border Leicester Ram. Using our prior lambing rate (175%), that would be 21 plus lambs that ram would sire in one year. A mature Ram can breed up to 50 ewes, that could mean 100 lambs with that Rams genetics. Taking that in consideration, we have been more selective of our Rams over the years. Generally, you will pay more for a Ram than a Ewe. 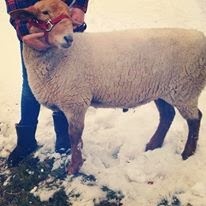 Some things we take in consideration when we purchase a Ram is size, confirmation , temperament, pedigree, fleece and age. We purchase registered breeding stock, each breed has its own standard, we try to be familiar with what that standard is. Each farm has its own goals, whether it is for better market lambs, improved fleece quality etc. Those goals need to be kept in mind when you are looking for a Ram. I still remember the first time we went to look for a Ram.I was clueless, but I had read a lot of sheep books and had a list of what to check for. We really didn't know quite what we were looking for, but that has changed over the years. Rams can be a little difficult to handle, not all of them are well mannered. For many years we have only had one Ram and we were able to leave him with the ewes, most of the year. We would remove the Ram from June-November. Not a big deal. With more than one, that is not possible. Rams typically do not like each other, especially during breeding season. So we have had to house them separately. Adding the Tunis breed has made things even more interesting, the Tunis Sheep will breed out of season. So no rams with the ewes over the summer. We are still working on a Ram housing plan. 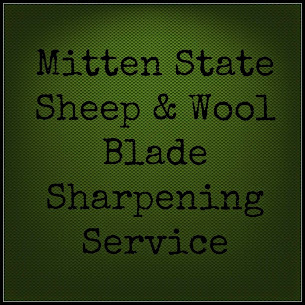 If you have sheep, I would love to hear what works for you? Max was a great Ram but it was time to bring in a new one. You can keep the same Ram for years (our first Ram lived here until he died of old age) but when you start keeping replacement ewes you will need another Ram to breed those ewes to. Life with Rams is inevitable if you raise sheep. They keep things interesting. I noticed the Tunis seem to be more full of themselves than our Border Leicesters have been. You learn to live with them. But there are a few rules. We never turn our back on our Rams, especially during breeding season. My girls have been taught that since they were little. Even our friendliest Rams have given us a push now and again. We keep a healthy respect for our Rams but I would not keep a Ram that I was afraid of. We also never make "pets" out of our Rams. We want them to have "respect" for us as well. And if they are a little afraid of me, that is okay. We do not tolerate head butting, pushing, or rearing up even from the cute little lambs. One day that cute little lamb will weigh over 200 pounds. Respect from both parties is needed. This is our newest addition, he does not yet have a name. Any suggestions? Ramekin I made caramel pudding in my ramekins today...so? I am quite enjoying your blog. Useful honest information. I do hope winter is b getting better for you. I have never heard of one of those before! Thanks for stopping by. No, they are different from Bucks. Both are handsome gents -- very interesting post about rams and breeding. Thank you Sandra! I went to the link, interesting storyline! Emmet is so handsome! You have lots of good ram advice. Rambo? Not very original I'm sure, but it's the first name that came to me. I like your approach to teaching about sheep. Thank you for that. :) Thanks for the suggestion! My girls usually name them, just can't find a name that fits this guy. We had a small flock of dorper sheep for two years. The ram was the only animal I've ever been afraid of. Your "rules" are good ones. We have had one Ram that my girls were afraid of, he wasn't very nice. I think where we got him from treated him as a pet. They can be the worse! Lisa, I agree. We are planning on a few feeder pigs this spring, and I am a little afraid of pigs! Should be interesting. What kind of pigs? I have had pigs and love them but I got them as babies and never treated them special..I had rules of behavior that were enforced. They are VERY smart and quite social! Perhaps a smaller breed like Berkshire of Guinea Hogs or Mulefoot? Home raised pork is one of the most incredible things when you have had store bought. Darker color and amazing flavor! Fiona, we are just looking at feeder pigs. A popular breed around here is hamps or crosses. Thanks for the suggestions! We purchased a finished hog last year, best bacon ever! Nice looking rams! Wise advice on how to live with rams without getting hurt. I'm facing a similar logistics problem as I change breeds to Finns that breed out of season. I think things will be a little more complicated. With your housing issues for rams would it be practical to build some small paddocks for them during the grazing months? A poly calf hutch would work well as a shelter for even a large ram. We have dairy and beef cattle. Your advice on rams is appropriate for all male animals. Healthy respect on both sides keeps us safe. Paula, thanks so much for stopping by and your suggestions! I appreciate it. Borachio! :D You have gorgeous sheep!